Active site between two monomers of glutamine synthetase from Salmonella typhimurium. Cation binding sites are yellow and orange; ADP is pink; phosphinothricin is blue. 12-subunit enzyme glutamine synthetase from Salmonella typhimurium. Glutamine Synthetase uses ammonia produced by nitrate reduction, amino acid degradation, and photorespiration. The amide group of glutamate is a nitrogen source for the synthesis of glutamine pathway metabolites. Other reactions may take place via GS. Competition between ammonium ion and water, their binding affinities, and the concentration of ammonium ion, influences glutamine synthesis and glutamine hydrolysis. Glutamine is formed if an ammonium ion attacks the acyl-phosphate intermediate, while glutamate is remade if water attacks the intermediate. Ammonium ion binds more strongly than water to GS due to electrostatic forces between a cation and a negatively charged pocket. Another possible reaction is upon NH2OH binding to GS, rather than NH4+, yields γ-glutamylhydroxamate. Glutamine synthetase – 12 subunits. Glutamine Synthetase can be composed of 8, 10, or 12 identical subunits separated into two face-to-face rings. Bacterial GS are dodecamers with 12 active sites between each monomer. Each active site creates a ‘tunnel’ which is the site of three distinct substrate binding sites: nucleotide, ammonium ion, and amino acid. ATP binds to the top of the bifunnel that opens to the external surface of GS. Glutamate binds at the bottom of the active site. The middle of the bifunnel contains two sites in which divalent cations bind (Mn+2 or Mg+2). One cation binding site is involved in phosphoryl transfer of ATP to glutamate, while the second stabilizes active GS and helps with the binding of glutamate. Hydrogen bonding and hydrophobic interactions hold the two rings of GS together. Each subunit possesses a C-terminus and an N-terminus in its sequence. 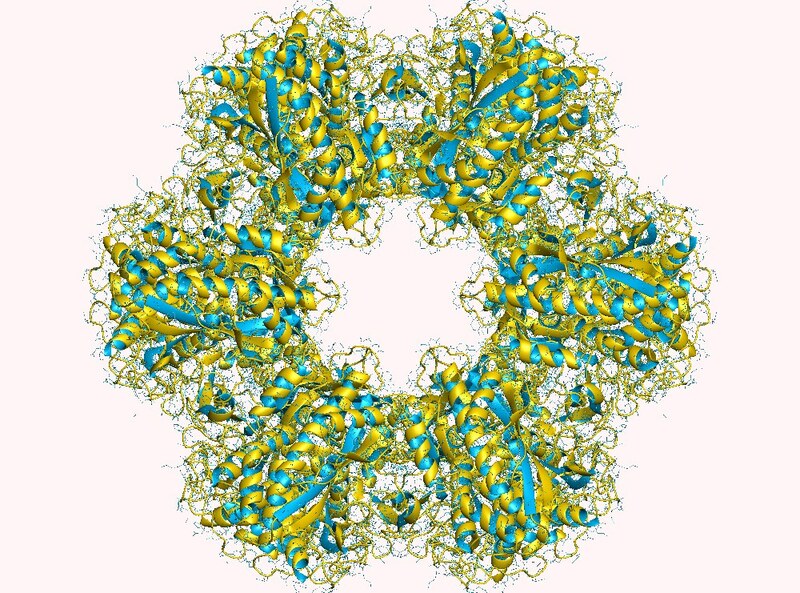 The C-terminus (helical thong) stabilizes the GS structure by inserting into the hydrophobic region of the subunit across in the other ring. The N-terminus is exposed to the solvent. In addition, the central channel is formed via six four-stranded β-sheets composed of anti-parallel loops from the twelve subunits. GS catalyzes the ATP-dependent condensation of glutamate with ammonia to yield glutamine. The hydrolysis of ATP drives the first step of a two-part, concerted mechanism. ATP phosphorylates glutamate to form ADP and an acyl-phosphate intermediate, γ-glutamyl phosphate, which reacts with ammonia, forming glutamine and inorganic phosphate. ADP and Pi do not dissociate until ammonia binds and glutamine is released. GS is present predominantly in the brain, kidneys, and liver. GS in the brain participates in the metabolic regulation of glutamate, the detoxification of brain ammonia, the assimilation of ammonia, recyclization of neurotransmitters, and termination of neurotransmitter signals. GS, in the brain, is found primarily in astrocytes. Astrocytes protect neurons against excitotoxicity by taking up excess ammonia and glutamate. In hyperammonemic environments (high levels of ammonia), astroglial swelling occurs. Different perspectives have approached the problem of astroglial swelling. One study shows that morphological changes occur that increase GS expression in glutamatergic areas or other adaptations that alleviates high levels of glutamate and ammonia. Another perspective is that astrocyte swelling is due to glutamine accumulation. To prevent increased levels of cortical glutamate and cortical water content, a study has been conducted to prevent GS activity in rats by the use of MSO. Class I enzymes (GSI) are specific to prokaryotes, and are oligomers of 12 identical subunits. The activity of GSI-type enzyme is controlled by the adenylation of a tyrosine residue. The adenylated enzyme is inactive. Class II enzymes (GSII) are found in eukaryotes and in bacteria belonging to the Rhizobiaceae, Frankiaceae, and Streptomycetaceae families (these bacteria have also a class-I GS). GSII are decamer of identical subunits.PDB: 2OJW​. Plants have two or more isozymes of GSII, one of the isozymes is translocated into the chloroplast. Another form is cytosolic. The cytosolic GS gene translation is regulated by its 5' untranslated region (UTR), while its 3' UTR plays role in transcript turnover. Class III enzymes (GSIII) have, currently, only been found in Bacteroides fragilis and in Butyrivibrio fibrisolvens. It is a double-ringed dodecamer of identical chains. It is much larger (about 700 amino acids) than the GSI (450 to 470 amino acids) or GSII (350 to 420 amino acids) enzymes. While the three classes of GSs are clearly structurally related, the sequence similarities are not so extensive. Regulation of GS only occurs in prokaryotes. GS is subject to reversible covalent modification. Tyr397 of all 12 subunits can undergo adenylylation or deadenylylation by adenylyl transferase (AT), a bifunctional regulatory enzyme. Adenylylation is a post-translational modification involving the covalent attachment of AMP to a protein side chain. Each adenylylation requires an ATP and complete inhibition of GS requires 12 ATP. Deadenylylation by AT involves phosphorolytic removal of the Tyr-linked adenylyl groups as ADP. AT activity is influenced by the regulatory protein that is associated with it: PII, a 44-kD trimer. PII also undergoes post-translational modification by uridylyl transferase, thus PII has two forms. The state of PII dictates the activity of adenylyl transferase. If PII is not uridylylated, then it will take on the PIIA form. The AT:PIIA complex will deactivate GS by adenylylation. If PII is uridylylated, then it will take on the PIID form. The AT:PIID complex will activate GS by deadenylylation. The AT:PIIA and AT:PIID complexes are allosterically regulated in a reciprocal fashion by α-ketoglutarate (α-KG) and glutamine (Gln). Gln will activate AT:PIIA activity and inhibits AT:PIID, leading to adenylylation and subsequent deactivation of GS. Furthermore, Gln favors the conversion of PIID to PIIA. The effects of α-KG on the complexes are opposite. In the majority of gram-negative bacteria, GS can be modified by adenylylation (some cyanobacteria and green algae or exceptions). Glutamine Synthetase activity influenced by its regulatory protein, which is designated PII. Inhibition of GS has largely focused on amino site ligands. Other inhibitors are the result of glutamine metabolism: tryptophan, histidine, carbamoyl phosphate, glucosamine-6-phosphate, cytidine triphosphate (CTP), and adenosine monophosphate (AMP). Other inhibitors/regulators are glycine and alanine. Alanine, glycine, and serine bind to the glutamate substrate site. GDP, AMP, ADP bind to the ATP site. L-serine, L-alanine, and glycine bind to the site for L-glutamate in unadenylated GS. The four amino acids bind to the site by their common atoms, “the main chain” of amino acids. Glutamate is another product of glutamine metabolism; however, glutamate is a substrate for GS inhibiting it to act as a regulator to GS.2 Each inhibitor can reduce the activity of the enzyme; once all final glutamine metabolites are bound to GS, the activity of GS is almost completely inhibited. Many inhibitory input signals allows for fine tuning of GS by reflecting nitrogen levels in the organism. Feedback regulation distinguishes the difference between two eukaryotic types of GS: brain and non-brain tissues. Non-brain GS responds to end-product feedback inhibition, while brain GS does not. High concentrations of glutamine-dependent metabolites should inhibit GS activity, while low concentrations should activate GS activity. Methionine Sulfoximine acting as an inhibitor to the glutamate binding site. Methionine sulfoximine (MSO): MSO is an inhibitor that binds to the glutamate site. Bound to GS, MSO is phosphorylated by ATP that results in an irreversible, non-covalent inhibition of GS. The S-isomer configuration is more inhibitory. Glutamate entry is blocked into the active site by a stabilization of the flexible loop in the active site by MSO. Phosphinothricin(PPT, Glufosinate): Phosphinothricin is an inhibitor that binds to the glutamate site. Glufosinate is used as an herbicide. Glufosinate treated plants die due to a buildup of ammonia and a cessation of photosynthesis. Many synthetic inhibitors are available today. Research on E. coli revealed that GS is regulated through gene expression. The gene that encodes the GS subunit is designated glnA. Transcription of glnA is dependent on NRI (a specific transcriptional enhancer). Active transcription occurs if NRI is in its phosphorylated form, designated NRI-P. Phosphorylation of NRI is catalyzed by NRII, a protein kinase. If NRII is complexed with PIIA then it will function as a phosphatase and NRI-P is converted back to NRI. In this case, transcription of glnA ceases. GS is subject to completely different regulatory mechanisms in cyanobacteria. Instead of the common NtrC-NtrB two component system, cyanobacteria harbour the transcriptional regulator NtcA which is restricted to this clade and controls expression of GS and a multitude of genes involved in Nitrogen metabolism. Moreover, GS in Cyanobacteria is not covalently modified to raise sensitivity for feedback inhibition. Instead, GS in Cyanobacteria is inhibited by small proteins, termed GS inactivating factors (IFs) whose transcription is negatively regulated by NtcA. These inactivating factors are furthermore regulated by different Non-coding RNAs: The sRNA NsiR4 interacts with the 5'UTR of the mRNA of the GS inactivating factor IF7 (gifA mRNA) and reduces its expression. NsiR4 expression is under positive control of the nitrogen control transcription factor NtcA. In addition, expression of the GS inactivating factor IF17 is controlled by a glutamine-binding riboswitch. ^ a b c PDB: 1FPY​; Gill HS, Eisenberg D (February 2001). "The crystal structure of phosphinothricin in the active site of glutamine synthetase illuminates the mechanism of enzymatic inhibition". Biochemistry. 40 (7): 1903–12. doi:10.1021/bi002438h. PMID 11329256. ^ PDB: 2GLS​; Yamashita MM, Almassy RJ, Janson CA, Cascio D, Eisenberg D (October 1989). "Refined atomic model of glutamine synthetase at 3.5 A resolution". J. Biol. Chem. 264 (30): 17681–90. PMID 2572586. ^ Eisenberg D, Almassy RJ, Janson CA, Chapman MS, Suh SW, Cascio D, Smith WW (1987). "Some evolutionary relationships of the primary biological catalysts glutamine synthetase and RuBisCO". Cold Spring Harb. Symp. Quant. Biol. 52: 483–90. doi:10.1101/sqb.1987.052.01.055. PMID 2900091. ^ a b c d e f g h Liaw SH, Kuo I, Eisenberg D (Nov 1995). "Discovery of the ammonium substrate site on glutamine synthetase, a third cation binding site". Protein Sci. 4 (11): 2358–65. doi:10.1002/pro.5560041114. PMC 2143006. PMID 8563633. ^ a b c d Liaw SH, Pan C, Eisenberg D (Jun 1993). "Feedback inhibition of fully unadenylylated glutamine synthetase from Salmonella typhimurium by glycine, alanine, and serine". Proc. Natl. Acad. Sci. USA. 90 (11): 4996–5000. doi:10.1073/pnas.90.11.4996. PMC 46640. PMID 8099447. ^ a b c d e f g h i j k l m n o Eisenberg D, Gill HS, Pfluegl GM, Rotstein SH (Mar 2000). "Structure-function relationships of glutamine synthetases". Biochim Biophys Acta. 1477 (1–2): 122–45. doi:10.1016/S0167-4838(99)00270-8. PMID 10708854. ^ a b c d e f g Liaw SH, Eisenberg D (Jan 1994). "Structural model for the reaction mechanism of glutamine synthetase, based on five crystal structures of enzyme-substrate complexes". Biochemistry. 33 (3): 675–81. doi:10.1021/bi00169a007. PMID 7904828. ^ a b c d Stryer L, Berg JM, Tymoczko JL (2007). Biochemistry (6th ed.). San Francisco: W.H. Freeman. pp. 679–706. ISBN 0-7167-8724-5. ^ Goodsell DS (June 2002). "Glutamine Synthetase". Molecule of the month. RCSB Protein Data Bank. Retrieved 2010-05-08. ^ a b c d e Krajewski WW, Collins R, Holmberg-Schiavone L, Jones TA, Karlberg T, Mowbray SL (Jan 2008). "Crystal structures of mammalian glutamine synthetases illustrate substrate-induced conformational changes and provide opportunities for drug and herbicide design". J Mol Biol. 375 (1): 317–28. doi:10.1016/j.jmb.2007.10.029. PMID 18005987. ^ Ginsburg A, Yeh J, Hennig SB, Denton MD (Feb 1970). "Some effects of adenylylation on the biosynthetic properties of the glutamine synthetase from Escherichia coli". Biochemistry. 9 (3): 633–49. doi:10.1021/bi00805a025. PMID 4906326. ^ Hunt JB, Smyrniotis PZ, Ginsburg A, Stadtman ER (Jan 1975). "Metal ion requirement by glutamine synthetase of Escherichia coli in catalysis of gamma-glutamyl transfer". Arch Biochem Biophys. 166 (1): 102–24. doi:10.1016/0003-9861(75)90370-7. PMID 235885. ^ a b c d Suarez I, Bodega G, Fernandez B (Aug–Sep 2002). "Glutamine synthetase in brain: effect of ammonia". Neurochem. Int. 41 (2–3): 123–42. doi:10.1016/S0197-0186(02)00033-5. PMID 12020613. ^ a b Willard-Mack CL, Koehler RC, Hirata T, et al. (March 1996). "Inhibition of glutamine synthetase reduces ammonia-induced astrocyte swelling in rat". Neuroscience. 71 (2): 589–99. doi:10.1016/0306-4522(95)00462-9. PMID 9053810. ^ Tanigami H, Rebel A, Martin LJ, Chen TY, Brusilow SW, Traystman RJ, Koehler RC (2005). "Effect of glutamine synthetase inhibition on astrocyte swelling and altered astroglial protein expression during hyperammonemia in rats". Neuroscience. 131 (2): 437–49. doi:10.1016/j.neuroscience.2004.10.045. PMC 1819407. PMID 15708485. ^ Kumada Y, Benson DR, Hillemann D, Hosted TJ, Rochefort DA, Thompson CJ, Wohlleben W, Tateno Y (April 1993). "Evolution of the glutamine synthetase gene, one of the oldest existing and functioning genes". Proc. Natl. Acad. Sci. U.S.A. 90 (7): 3009–13. doi:10.1073/pnas.90.7.3009. PMC 46226. PMID 8096645. ^ Shatters RG, Kahn ML (November 1989). "Glutamine synthetase II in Rhizobium: reexamination of the proposed horizontal transfer of DNA from eukaryotes to prokaryotes". J. Mol. Evol. 29 (5): 422–8. doi:10.1007/BF02602912. PMID 2575672. ^ Brown JR, Masuchi Y, Robb FT, Doolittle WF (June 1994). "Evolutionary relationships of bacterial and archaeal glutamine synthetase genes". J. Mol. Evol. 38 (6): 566–76. doi:10.1007/BF00175876. PMID 7916055. ^ "GSI structure". Archived from the original on 2008-12-17. Retrieved 2009-03-31. ^ Ortega JL, Wilson OL, Sengupta-Gopalan C (December 2012). "The 5' untranslated region of the soybean cytosolic glutamine synthetase β(1) gene contains prokaryotic translation initiation signals and acts as a translational enhancer in plants". Molecular Genetics and Genomics. 287 (11–12): 881–93. doi:10.1007/s00438-012-0724-6. PMC 3881598. PMID 23080263. ^ van Rooyen JM, Abratt VR, Sewell BT (August 2006). "Three-dimensional structure of a type III glutamine synthetase by single-particle reconstruction". J. Mol. Biol. 361 (4): 796–810. doi:10.1016/j.jmb.2006.06.026. PMID 16879836. ^ a b c d e f Garrett, Grisham (2017). Biochemistry (6th Edition). United States of America: Cengage Learning. pp. 886–889. ISBN 978-1-305-57720-6. ^ Ivanovsky RN, Khatipov EA (1994). "Evidence of covalent modification of glutamine synthetase in the purple sulfur bacterium". FEMS Microbiology Letters. 122 (1–2): 115–119. doi:10.1111/j.1574-6968.1994.tb07153.x. ^ Krishnan IS, Singhal RK, Dua RD (Apr 1986). "Purification and characterization of glutamine synthetase from Clostridium pasteurianum". Biochemistry. 25 (7): 1589–99. doi:10.1021/bi00355a021. PMID 2871863. ^ Bolay, Paul; Muro-Pastor, M.; Florencio, Francisco; Klähn, Stephan (27 October 2018). "The Distinctive Regulation of Cyanobacterial Glutamine Synthetase". Life. 8 (4): 52. doi:10.3390/life8040052. ^ Merrick MJ, Edwards RA (December 1995). "Nitrogen control in bacteria". Microbiological Reviews. 59 (4): 604–22. PMID 8531888. ^ Fisher R, Tuli R, Haselkorn R (June 1981). "A cloned cyanobacterial gene for glutamine synthetase functions in Escherichia coli, but the enzyme is not adenylylated". Proceedings of the National Academy of Sciences of the United States of America. 78 (6): 3393–7. PMID 6115380. ^ Vega-Palas MA, Flores E, Herrero A (July 1992). "NtcA, a global nitrogen regulator from the cyanobacterium Synechococcus that belongs to the Crp family of bacterial regulators". Molecular Microbiology. 6 (13): 1853–9. PMID 1630321. ^ Reyes JC, Muro-Pastor MI, Florencio FJ (April 1997). "Transcription of glutamine synthetase genes (glnA and glnN) from the cyanobacterium Synechocystis sp. strain PCC 6803 is differently regulated in response to nitrogen availability". Journal of Bacteriology. 179 (8): 2678–89. PMID 9098067. ^ García-Domínguez M, Reyes JC, Florencio FJ (June 1999). "Glutamine synthetase inactivation by protein-protein interaction". Proceedings of the National Academy of Sciences of the United States of America. 96 (13): 7161–6. PMID 10377385. ^ García-Domínguez M, Reyes JC, Florencio FJ (March 2000). "NtcA represses transcription of gifA and gifB, genes that encode inhibitors of glutamine synthetase type I from Synechocystis sp. PCC 6803". Molecular Microbiology. 35 (5): 1192–201. PMID 10712699. ^ Klähn S, Schaal C, Georg J, Baumgartner D, Knippen G, Hagemann M, Muro-Pastor AM, Hess WR (November 2015). "The sRNA NsiR4 is involved in nitrogen assimilation control in cyanobacteria by targeting glutamine synthetase inactivating factor IF7". Proceedings of the National Academy of Sciences of the United States of America. 112 (45): E6243–52. doi:10.1073/pnas.1508412112. PMC 4653137. PMID 26494284. ^ Klähn S, Bolay P, Wright PR, Atilho RM, Brewer KI, Hagemann M, Breaker RR, Hess WR (August 2018). "A glutamine riboswitch is a key element for the regulation of glutamine synthetase in cyanobacteria". Nucleic Acids Research. doi:10.1093/nar/gky709. PMID 30085248. This page was last edited on 1 April 2019, at 12:39 (UTC).